Summer is for relaxing, not battling the heat. A Trane central air conditioner allows you to rest comfortably day or night while eliminating the worry about your next utility bill. Each of our central air conditioning systems are designed to give you a cooler, happier life. So whether you’re hosting a summer get together or having a movie night in, you can relax peacefully knowing your home cooling needs are backed by a Trane air conditioner. The benefits of owning a Trane central air conditioning unit do not end after installation. 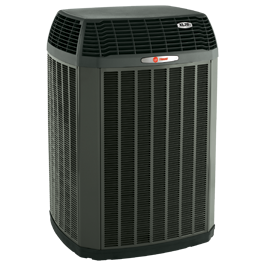 Each AC unit is backed with a Trane warranty, guaranteeing a cooler, more comfortable home year round. The XV20i air conditioner is one of the industry’s most efficient systems, with ratings up to 21 SEER. With Trane TruComfort™ technology, the 21-SEER air conditioner automatically adjusts itself while maintaining constant and consistent speeds to avoid temperature swings. Add Trane CleanEffects™ to your system to filter the incoming air to eliminate dust, pollen, and other irritants for a cleaner, healthier, and more comfortable home. Install a Goodman brand air conditioner and get all three — and what we believe to be the best warranty protection in the heating and cooling industry. 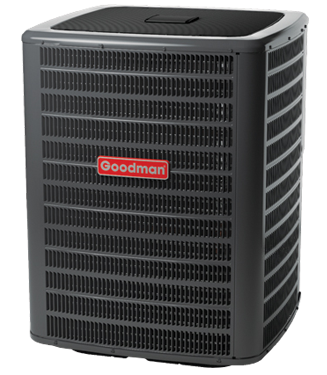 As you review the various Goodman brand air conditioners, remember that higher SEER numbers reflect the most energy-efficient systems.